Door sensors don’t keep intruders from entering your home, but they will alert you to any unwanted guests. When set up correctly, they can set off an in-home alarm or send silent alerts to you, your security company, and the authorities. 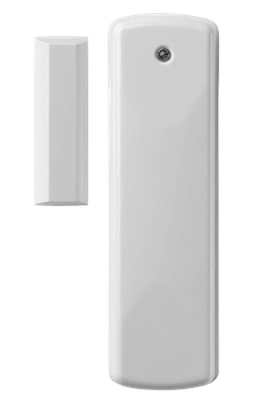 Most door sensors come with two pieces: one that attaches to the door frame and another that attaches to the door itself, creating a closed circuit. When someone opens the door, the circuit is broken and the sensor reacts accordingly. While not the most proactive measure to deter home break-ins, a door sensor can help you act quickly if a break-in occurs. It might even scare off the burglar. Burglars know to look for open windows and doors before resorting to more difficult measures to enter your home. Unfortunately, that means a lot of the break-ins that occur every year are more like walk-ins. Equipping your doors with proper door locks can prevent the easy intrusions into your home, but as an extra layer of security, you might want to consider door sensors. Door sensors will alert you, your security company, or the authorities as soon as an unwanted guest enters your home. Some door sensors can even set off an alarm in the home, which can quickly deter would-be intruders. Most door sensors work using a reed switch and a magnet to determine when a door is open or closed. A reed switch is a circuit that can be opened and closed with magnets. Most laptops and flip phones use reed switches so they know to sleep when they’re closed. Similarly, when a door is closed, the magnet’s proximity to the reed switch closes the circuit. Then when someone opens the door, the magnet is pulled away from the reed switch, which triggers the sensor. Make sure both pieces work prior to installation. Place the sensor out of reach from children and pets. Use strong adhesive so both pieces stay securely in place. Once installed, test the system a few times to ensure it works properly. The main perk of having a door sensor is that it alerts you to unexpected entries. Depending on your security system, you might be able to choose between an audible in-home alarm that would likely scare away intruders, or a silent trigger that quietly notifies your security company of a potential break-in. You can also place door sensors on cabinets, doors, or drawers that are off-limits to certain members of the house, like a liquor cabinet or home office. Most alarm systems also come with a delay setting to give you some extra time if you accidentally trigger the sensor. It happens to everyone, and it’s much easier to disable the alarm with those few extra seconds than talk your way out of it once the police arrive. Some door sensors come with a few additional customizable options for more than just home security. For example, you might be able to set up a door chime when you’re home that politely notifies you when someone is coming home or leaving the house. Door sensors are an important layer of security to your home, but they’re not a complete solution on their own. For a more comprehensive home security system, take a look at some of the recommended resources below.